Lenin, Soviet Union by rlzobreaker is licensed CC BY 2.0. I've read a fair number of books about the Soviet Union recently. Each book has done a good job of explaining the problems with the Soviet experiment - the brutality that was used to install the system during the October Revolution; Stalin's symptomatic and seemingly random cruelty; the way politics and ideology bled into every single corner of Soviet life, even the sciences, stalling technological progress; the inherent inefficiencies of the command economy, especially as implemented under "Socialism in One Country"; and so on. None of them, however, explained why the Soviet Union collapsed. Sure, the system wasn't as efficient as capitalism, but North Korea and Cuba have both proven that's not enough to prevent a totalitarian "socialist" government from maintaining power. North Korea's mass starvation in the 1990's proved that a major disaster isn't enough to topple a totalitarian government (as if the Holodomor wasn't sufficient to prove this already), so why is Chernobyl considered one of the keys to the collapse of the Soviet Union? Why was Gorbachev so unsuccessful in his attempts to reform the Soviet system? 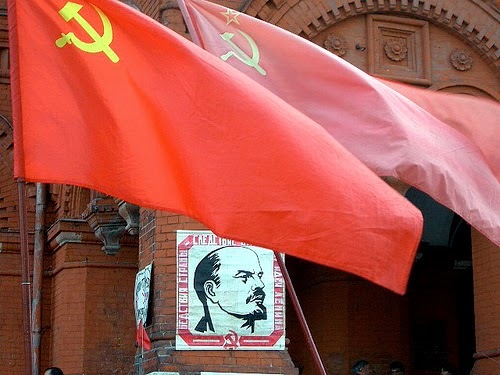 What made the Soviet Union different? What happened? Halfway through the first chapter of The Russians, I immediately understood. Pretend you work in a widget factory for a multinational conglomerate. It's a big, sprawling mess of a company, with as many employees as you can imagine and locations all over the world. To keep the company moving in nominally the same direction, several policies and procedures have been crafted and they are strictly enforced. To ensure the company's procedures are followed and losses are minimized, the company utilizes a sophisticated system of intelligence gathering - surveillance cameras wherever possible, paid bonuses to employees that tattle on their coworkers, transfers to unpleasant departments for people that are found guilty of minor transgressions, and termination of employees caught doing anything halfway major. One of the rules that all divisions of the company must follow is they are not allowed to buy anything from external vendors if it's being made internally - since the company is quite large and makes all sorts of things, this means the company sources most of its supplies internally. From pens to automobiles to produce to machine parts, the company makes near everything for itself, which ensures that its competition never profits from the company; if the company can't make something, it usually tries to find as close to a substitute as it can make internally, if possible, while it tries to find a way to ultimately supply that thing internally in the long run. This even extends to news and entertainment - since the company owns some newspapers, radio stations, and TV stations, only company-owned newspapers, radio programs, and TV shows are allowed on company grounds. Another rule that employees of the company must follow - and failure to abide by this rule will lead to swift termination - is they are expressly forbidden from talking to employees of competing companies, lest they leak "trade secrets". Since the company makes and sells just about anything and everything, that effectively means that employees of the company can only safely socialize and talk among themselves. To further restrict potential leaks, the company strongly discourages employees from even talking among each other, especially to employees from other divisions. From your perspective, your particular division doesn't seem to be run particularly well. In fact, near as you can tell, it's run unconscionably poorly. There are frequent supply issues - sometimes you end up with the wrong parts, sometimes the quality of the parts is extremely poor, sometimes you just don't end up with the supplies you need at all. Consequently, your division has serious difficulties satisfying the needs of other divisions that rely on your widgets, to say nothing of your company's customers. Though you and your coworkers generally do your best, you each catch yourselves sometimes letting things slip, letting a substandard widget or two through - better they receive a bad widget than no widget at all, right? Besides, the company has strict quotas about what each division is supposed to produce, and the penalties for failing to produce enough widgets - of any quality - are best left unsaid. On top of the supply and production issues, your division also suffers from a steadily ratcheting culture of micromanagement. For example, management determined one day that it took you 38 seconds to walk from the time clock to the widget press; consequently, if you ever take 39 seconds, you are supposed to lose an hour of pay due to "laziness". One of your coworkers was informed that "shock workers" - the best workers from other widget factories - only required a 74-degree deflection from the top of the press lever to the bottom, which was more efficient than pushing the press down as far as possible due to the reduced range of motion and reduced wear and tear on the press; however, when your coworker attempted to apply this advice, he found that his press wouldn't always cut the widget all the way through the metal. Even so, failure to adhere to management's policies and procedures was strictly frowned on; the last thing your coworker needed was for you or one of your coworkers to turn him in for using a 75-degree deflection and collect that informer's bonus while he and his family were transferred to North Dakota. Despite it all, though, your division muddles through and keeps producing widgets. Believe it or not, you and your coworkers take pride in your work. Sure, your division may be one of the most poorly run divisions in the company, but you each get it done when it matters and still find a way to deliver. In your own, imperfect way, you and your division are helping to make the company you work for successful. Fellow coworkers around the world - around the world! - count on you and your widgets, a fact that's brought up during every employee meeting, in every internal newsletter, and sometimes even in the company news broadcasts. Not everyone can say their work is relied upon across the world. To make sure nobody in the world is let down by your poorly run division, you and your coworkers bend the rules a bit. In exchange for you re-pressing some of your coworker's widgets, he'll sometimes clock you in while you're already walking to your press - this way you don't get in trouble for walking too slowly between the time clock and the press and he doesn't get in trouble for improperly pressing his widgets. You have similar arrangements with other coworkers to work around some of the other rules put into place by management, and vice-versa; though this means you could inform on half of the plant if you so desired, they could also inform on you in a heartbeat. None of you really want to do that, though - if the rules weren't bent, the widgets wouldn't get made and none of you would get paid. Sometimes, you even bend the rules a bit and talk to people outside the company - none of them make widgets, so it's probably not competing, right? - or even sneak in some tools and supplies from outside of the company when nobody's looking. Sure, maybe one of the conglomerate's other divisions is losing business because of this, but some of the tools and supplies you're bringing in are really good - way better than anything you can find internally, assuming you can even find it in the first place - and, after all, your job is to produce widgets, right? As long as your division meets its widget quote, it's surely all good. Again, the alternative is best left unsaid. One day you wake up and one of your friends from outside the company is calling you. You answer and they immediately ask if you're okay, if you're all right, if your coworkers are all right. "Of course we are," you reply, "why wouldn't we be?" "There was a terrible accident at one of your factories - it's in all the news! ", they exclaim. "I'll look into it," you declare, then get ready for work. Once you get to the factory, everything appears normal. Your coworkers are still making widgets, parts and supplies (such as they are) are still coming in like normal. There are no announcements over the intercom and the internal company newsletter mentions nothing out of the ordinary. Surely there was no disaster, you decide, and tell your friend as much once you get home. A week later, you spot a terse notice in the company newsletter - "Sprockets from the Tennessee Valley factory will be unavailable until further notice." That's it - no explanation, no further details. Even so, that sole sentence is rather strange. You can't think of a single time that the company shut down an entire supplier without some sort of planning, some sort of announcement beforehand. This is very peculiar. A week after that, a letter from the new CEO thanks the Tennessee Valley factory workers for their "sacrifice" and also thanks the company's internal disaster response team for their "service to the factory workers". "Remaining factory workers", the CEO further explains, "will be transferred to other factories." Two weeks later, a couple of new factory workers arrive. They look like they haven't slept in ages. They claim they're from "Kentucky", but neither of them say much else. They barely talk to each other and never talk to anyone else. At first, you and your coworkers decide they must be informants - these two aren't willing to "scratch your backs", nor do they seem particularly interested in letting anyone else "scratch theirs". After about a month or so, though, none of you notice any odd firings or transfers, so each of you decide these two just must be the quiet type and leave them alone. You and your coworkers are really starting to like the new CEO. He's much younger than any previous CEO you can remember, and the company news all show him visiting and conversing with other division workers - really conversing with them, not just lecturing at them or letting them parrot company-sourced motivational phrases. Your father, who also worked for the company when he was your age, mentioned there being a CEO like this one when he was your age, but "that CEO didn't last long". You hope this new CEO lasts a while. Recently, the new CEO announced two new changes to the rules. First, he announced, the company was going to pursue a policy of "Openness" - though employees were still forbidden from talking to employees of competing firms, they were now expressly encouraged to talk to each other, even if they were in separate divisions. Next, he announced the company was going to pursue a policy of "Restructuring" - it was no longer forbidden for company divisions to purchase goods from competing companies. Finally!, you and your coworkers thought to yourselves. Now you can get supplies and parts from anywhere - no more waiting on unreliable internal suppliers of dubious quality. Surely you'll be producing your quota of widgets in no time. However, you and your coworkers quickly discover that you actually can't - there's no money. It was one thing sneaking in the occasional used tool or scrap when times were tight - none of your competitors minded that - but it turns out it's something else entirely when you want a regular supply of something at a consistent quality. In fact, now that your division is a potential customer, your competitors are even keeping a closer eye on their leftovers. Meanwhile, as you and your coworkers grow increasingly confident in talking to each other - really talking to each other - about work, about life, and even talking to people in other divisions about these things, you begin to realize that your division isn't particularly poorly run - all of the company's divisions are poorly run. Every single coworker you talk to from every other division shares with you the same stories you know so well - of failed supply lines, lousy quality, and endemic micromanagement. Near as any of you can tell, none of you have made anything bought by anyone other than another company division; the company swears it has billions upon billions in sales, but none of your coworkers are making enough widgets or anything else to meet internal demand, much less enough to sell to the public. This, you suspect, explains why your division has no money to buy anything. At the same time, you also discover that several other divisions also had some silent transfers, just like the two guys that showed up at your factory a year ago. Some of them, it turns out, are actually willing to talk about what happened now, and the stories they tell leave you awestruck. They describe, independent of one another and with near-total fidelity between each of them, a horrific cataclysm, one that killed several of their coworkers and led to entire cities being evacuated. The pollution from the cataclysm destroyed nearby forests and rendered much of the surrounding countryside uninhabitable. The kicker? The factory is still open. Despite the disaster, despite the devastation, the company still insists that factory workers show up at the remains of the factory each day and keep the lines that weren't destroyed operational. You can't believe it - surely, after a disaster like that, they would shut down such an unsafe factory, or spend some time rebuilding it so such a disaster would never occur again, or... or something. If they won't shut that factory down, if they won't make that one safe after something like that, how do you and your coworkers know that your factory is safe? "I'm not showing up here again until they get this place fixed up, and I don't think any of you should, either." Then, even more amazingly, the manager left. At first, you and your coworkers are at a loss. Do you keep working? Do you go home? Something like this has never happened before - a manager has never, ever walked off the floor like that. On the other hand, the manager did tell all of you to go home... right? You and your coworkers talk among yourselves for a bit, trying to sort out what to do next. Finally, after a while, one of your coworkers announces that, "screw it", they're going home. Then, a little while later, another one makes the same announcement and leaves. Then another. Then another. Before long, it's clear to the rest of you that there won't be enough workers around to run the factory, so all of you might as well just head home. What you don't realize is that, while this is going on in your widget factory, the same conversations are happening in every other division in the company, and many of them are making the same decision yours did. Before long, none of the divisions are able to work - since your factory isn't making widgets anymore, any division that relied on your widgets has to shut down, which causes other factories and offices down the line to shut down as they lose their supplies of whatever divisions the widgets were supplying, and so on. Just like that, the entire company collapses, one division at a time like a row of dominoes, first slowly, then really, really quickly as each small failure in the company cascades into progressively larger and larger ones. It doesn't take any time at all before, one day, you wake up and read in the newspaper that the company you work for - the company you worked for - is now bankrupt and liquidating its assets. That, more or less, is what happened to the Soviet Union. It might - might - have been able to survive Chernobyl if a hard-line Stalinist was at the helm and carefully controlled information about the disaster, or at least left everyone so fearful about the consequences of speaking up that they'd continue to work anyway. It might - might - have survived (or even thrived!) after Glasnost and Perestroika if Chernobyl didn't prove that the people in charge of the USSR had been all too willing for far too long to sacrifice everything - people, the countryside, everything - for the sake of the system as it was written on paper. It might - might - have survived losing in Afghanistan, might have survived the oil glut of the 1980's, might have survived the effort required to keep the increasingly dysfunctional satellite states in the Warsaw Pact economically viable, might have endured the Soviet Union's increasingly expensive adventurism in Africa. But the Soviet Union couldn't survive all of these things - not with a polity that, by the 1970's, the time period The Russians describes, was already doing everything within its power to work around the system to meet their needs. Once it became clear, crystal clear, that the system didn't mean well, that the system simply didn't work, it didn't take long before everyone just stopped pretending to live under its rules anymore. And that was that. That was the end. In short, by the 1970's, the communist experiment, at least in the Soviet Union, was already done. Everybody had been working around it for generations by that point. They tolerated working around the system because they thought that, well, maybe it's kind of working - who knows? There was a time, especially in the 1950's and 1960's, when it really did look like it was working, when it really did look like it might catch up to the capitalist countries in the West. There were Soviets flying to space, advanced Soviet military hardware going toe-to-toe against the West in Vietnam and Africa, even the standard of living was slowly but steadily improving. But, once the Soviets started comparing notes with each other, once the Soviets started comparing notes with what was really going on outside the Soviet Union, and once the Soviets came to grips with their past - not all of it, not even close to all of it, but enough of it - they realized that enough was enough. Will that happen here some day? Why didn't it happen in Cuba or North Korea? What happened in China? These are good questions, but they will have to wait for another day.